This issue: tribute to tight grips! 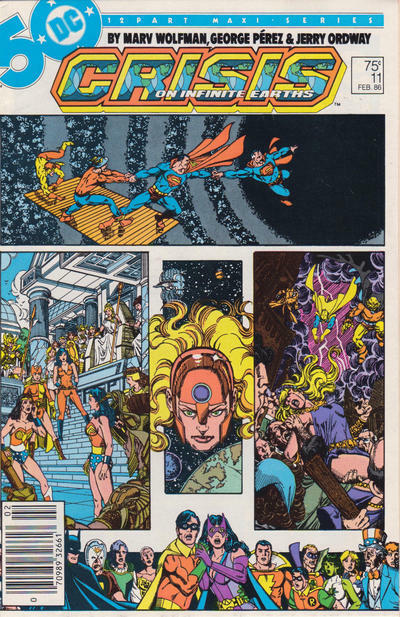 The penultimate issue of Crisis On Infinite Earths offers an interlude critical to the series’ success. It demonstrates the real impact of DC’s housecleaning not with antimatter waves or shadow demons, but through the characters who helped build the publisher’s matchless history. Accordingly, Crisis #11 features emotional impacts just as devastating as any of its cosmic carnage. For those who might have come in late, since last December I have been revisiting every issue of DC Comics’ landmark Crisis On Infinite Earths, approximately on the thirtieth anniversary of their arrivals in comics shops. (The newsstand versions each debuted a month later.) Links to earlier installments will appear at the bottom of this post. I wanted to revisit COIE in this format because that’s how I (and countless other Reagan-era readers) first experienced it. Nowadays it’s easy to digest these big-event miniseries in one sitting, and to poke through their various twists, turns, and inconsistencies. Of course there’s nothing wrong with that. I’m sure by this point most of Crisis’ readers came to it as a collection. However, Crisis wasn’t just a story. (Some might say Crisis was barely a story to begin with.) Instead, it was an argument for restructuring all of DC’s superhero books in a way that would forever alter how they were viewed. Crisis’ tagline promised that worlds would live and die, and nothing would ever be the same — and it delivered. Amongst all the process, plot machinery, and exposition — and the clunky, obvious, and awkward moments — it kept those ad-copy promises. Now, imagine you’ve been getting Crisis not in collected form, but every month in single-issue form. At the end of issue #4 you saw the apparent destruction of Earths-One and -Two, representing the bulk of DC’s fifty-year output. Issues #7 and #8 brought the deaths of Supergirl and the Barry Allen Flash. Issue #9 and the first half of #10 were the “Villain War,” a sprawling series of super-fights across three of the five remaining Earths. Then, at the end of issue #10, all the good guys had gone back to the Dawn of Time to prevent the Anti-Monitor from reshaping history for his own evil purposes. It had come down to the Spectre, pumped full of super-energy from the assembled heroes, wrestling a similarly-supercharged Anti-M with the fate of all creation at stake. There was a flash of white, the page’s very panels shattered, and once again everything went blank…. … and you had to wait four weeks for this issue, Crisis On Infinite Earths #11, which appeared in the Direct Market thirty years ago, during the first week of October 1985. Credits: COIE #11 was co-plotted, scripted, and edited by Marv Wolfman, co-plotted and pencilled by George Pérez, inked by Jerry Ordway, colored by Carl Gafford, and lettered by John Costanza. Bob Greenberger was the associate editor, and Len Wein was the consulting editor.